Who can love us more deeply? It is the Lord our God. Who will love us more wholly, without reservation? It is the Lord our God. Who will pick us up when we fall and clean us off. It is the Lord our God. Who will tend to our wounds, heal our ailments and set us free? It is the Lord our God. Who worries for us and sees to our well being? It is the Lord our God. of food rich and juicy, of fine strained wines. On this mountain he will remove the mourning veil covering all peoples, and the shroud enwrapping all nations, he will destroy Death for ever. he will take away his people’s shame everywhere on earth, for the Lord has said so. That day, it will be said: See, this is our God in whom we hoped for salvation; the Lord is the one in whom we hoped. that he has saved us; for the hand of the Lord rests on this mountain. Jesus reached the shores of the Sea of Galilee, and he went up into the hills. He sat there, and large crowds came to him bringing the lame, the crippled, the blind, the dumb and many others; these they put down at his feet, and he cured them. The crowds were astonished to see the dumb speaking, the cripples whole again, the lame walking and the blind with their sight, and they praised the God of Israel. But Jesus called his disciples to him and said, ‘I feel sorry for all these people; they have been with me for three days now and have nothing to eat. 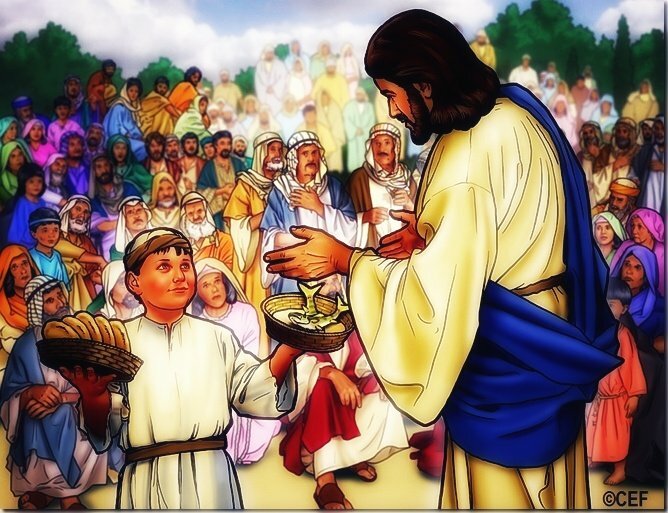 I do not want to send them off hungry, they might collapse on the way.’ The disciples said to him, ‘Where could we get enough bread in this deserted place to feed such a crowd?’ Jesus said to them, ‘How many loaves have you?’ ‘Seven’ they said ‘and a few small fish.’ Then he instructed the crowd to sit down on the ground, and he took the seven loaves and the fish, and he gave thanks and broke them and handed them to the disciples, who gave them to the crowds. They all ate as much as they wanted, and they collected what was left of the scraps, seven baskets full.